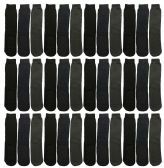 12 Units of 12 Pairs of SOCKSNBULK Thermal Socks, Men Boot Socks, Hiking Socks (877TH) - Mens Thermal Sock at low wholesale prices. alltimetrading.com offers Mens Thermal Sock at bulk discounted prices. THICK BOOT SOCKS FOR MEN: Perfect for the winter time to keep your feet warm! HIKING SOCKS: Buy these socks to wear in boots to stay warm!